"I received a bike last year and it was beautiful," Mariana (who preferred we just use her first name) recalled. "I didn't know how to ride before. But I was able to take my son to school. It also helped me lose seven pounds, and save time. Instead of walking somewhere in 45 minutes, I could ride my bike there in 15 minutes." Mariana was one of 17 women from the Corcoran Neighborhood Organization’s Mujeres en Accion y Poder who signed up to participate in the 2013 Community Partners Bike Library (CPBL) program, a free loaner bike program of Cycles for Change in St. Paul. During the June 4 orientation session at Powderhorn Park Recreation Building in Minneapolis, she got training and coaching on cycling safety and on proper techniques for locking a bike, fitting a helmet, and loading a bike onto a bus rack. Marianne Baum of CPBL explained that participants may take Learn to Ride, Basic Mechanics, and Riding in Traffic classes, as well as participating in group rides. CPBL plans to partner with 19 community organizations to lend 275 bikes and 20-30 trailers this year. Partners include Project for Pride in Living, CLUES, Goodwill Easter Seals, and the Karen Organization of Minnesota. Leadership programs are also a part of the project. Interested participants will have the opportunity to learn how to teach biking skills to other members of their communities. Jony Ive redesigns the bicycle. June's theme is Biking Bakeries! 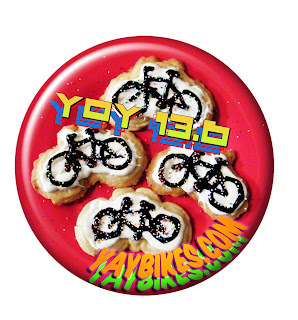 Best Biking Bakeries calls out to all riders this coming Saturday. Support our vendors and local businesses. Ride with your handlebar and saddlebags, mount your panniers and take some bakery goods home with you. There will simply be too much good stuff to enjoy on the tour. Share them with your friends and family and know they were delivered carbon free. Please support our vendors by buying their products on Saturday. Beyond the Metal from Sidewayz Films on Vimeo. The Tour Divide 2013 starts Friday, June 14th, 2013! Racers will make their way from Bannf, Alberta Canada on their way to Antelope Wells! TourDivide.org and via SPOT GPS atTrackleaders.com! And follow the discussion here. Check out the Google Doc with the start list here. This year Ed Turkaly will be riding to raise money for Schwachman-Diamond Syndrome. Please consider donating to the cause and follow along as Ed rides the Tour Divide! Help Ryan Sigsbey reach his goal for Trips for Kids WNC! **Note: With the TourDivide site currently down, Chris Bennett has posted the rules out on hiswebsite! Get lost in the woods, but don’t lose your charge! The HALO powers devices for the outdoor enthusiast and emergency preparedness. The HALO Fuel Cell is an outdoor power station that fits standard fuel canisters. It is sized to be a portable, compact, and lightweight addition to your current gear. HALO allows you to keep your electronics running while on camping trips or the times you are left without electricity. The Halo Fuel Cell charging an iPad. The HALO Fuel Cell uses our patented fuel cell technology (M-SOFC) to charge USB-compatible devices. Our M-SOFC cells are made primarily of stainless steel, with very thin layers of ceramic. The M-SOFC is extremely rugged, capable of rapid thermal cycling and abusive thermal shock, and tolerant to all types of fuels with no fuel processing.This is not a thermoelectric generator. Fuel cells are more efficient than thermoelectrics and more convenient than solar. There are no moving parts in the HALO. The ring of fuel cells is housed in a high quality stainless steel body. An optimized circuit transfers energy from the fuel cell directly into your device. As for the lifetime of the fuel cells, they last years under normal usage. You shouldn’t have to think about the time of day or the weather to charge your electronics. The HALO Fuel Cell will work rain or shine. We’ve designed the product to charge two devices simultaneously. Perfect if your friend needs a charge too. A warm orange glow generated from the hot fuel cells functions as a reminder the HALO is turned on. It also just looks cool. Local tourism officials see the next wave of visitors to the region arriving on two wheels. For the first time, the Great Waterfront Trail Adventure is bringing about 200 bike enthusiasts from the U.S., Ontario, Quebec and Alberta to the area in August to ride along Lake Erie. The supported cycling tour starts in Lakeshore and runs through Windsor and Leamington before ending seven days later after 600 kilometres in Fort Erie. For the past five years the Great Waterfront Trail Adventure has toured 730 kilometres of Lake Ontario from Niagara to the Quebec border. The cycling tour is just one of the reasons Tourism, Windsor, Essex, Pelee Island is bringing in experts from the Cyclists Network to get local businesses certified as able to accommodate cycling tourists. Know as you watch this video that only minor injuries were suffered, so you're free to enjoy these crashes as slapstick, and a true mess of course design. This comes from Sunday's Crystal Cup bike race outside of Washington, D.C., part of the Air Force Association Cycling Classic. The initial crash, at the 33-second mark, looks worse than it is. The camera doesn't capture the collision, but it's not the car hitting the race marshal. It's a straggler behind the peloton that clips her and knocks her down—the car was thankfully able to stop before hitting the downed cyclist. But wait: that's the lead car. Take a look at the course map—this is the north section. The peloton is coming back around. They have no idea what's waiting for them. As officials desperately try to get the riders to stay right (even as one yells, "Left! Left! "), one swings wide and attempts to bunny hop the prone marshal. It goes poorly. That rider, Tim Rugg, wrote about the crash on his blog. What is a Complete Street? It has adequate crosswalk, sidewalks for all abilities, and designated cycling paths. Do you have easy access to schools, parks, medical facilities and simple services like grocery and drug stores? Do you have alternative transportation options when the car is in the shop? Does your neighborhood have sidewalks? And if so, are they well maintained? If you are like the large majority of Americans, your plan is to stay in your community — if not in your very same home — as you get older. However, in order to do so, you need to be confident that your community has convenient, safe and reliable options to get you where you need and want to go. The inspiring true story of how a humble rail-trail has helped Cleveland bounce back from the Rust Belt doldrums... It's wonderful to see the fruits of our labors - we are inspired to keep helping America's communities reap the benefits of bike- and walkability! BicycleTraveler Magazine June 2013 - NOW AVAILABLE FREE! Edward Genochio reflects on why he takes bicycle journeys. Diverse images from the bike touring survival guide book cover photo contest. Cycled from Norway to South Africa on an electric bike. 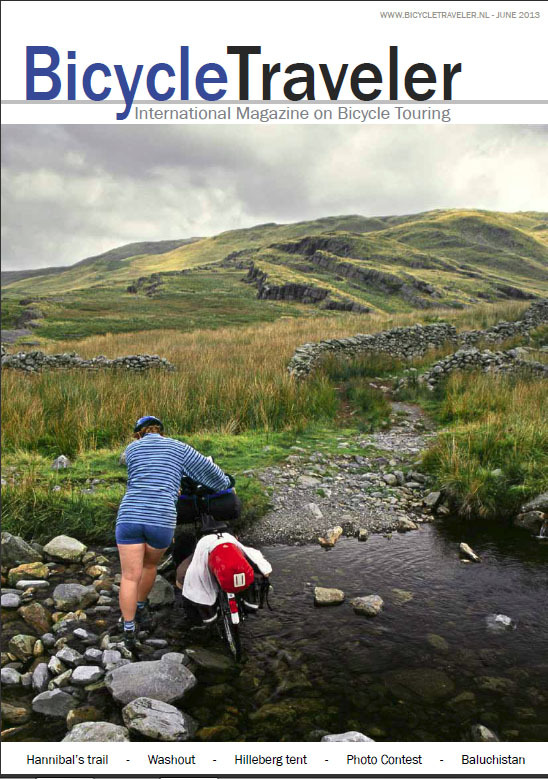 Bicycle Traveler is an international magazine about bicycle touring. It’s full of entertaining stories and inspiring photography which will have you dreaming over new destinations and the latest cycling gear. Subscribe to the magazine (it's free!) so that you don’t miss out on future editions. Stainles steel unique frame without seat tube. 100% handmade in Estonia. Two identical tube frames rune alongside the entire fraem. Joined at the head tube, seat tube and bottom bracket. This frame is still in prototype mode. First set of frames are in the production for first customers. Estimated to be finished by the end of April. After that a new patch will go into making. If ou are interested in getting on Viks (entire bike or just a frame), send an email to info@velonia.comand get on the waiting list. Check out Viks's facebook page for more updates and news. When I’m with my bike, “Where’s your helmet? !” is a real popular question from just about anybody who feels entitled to exercise passive-aggressive judgment in question form. Thankfully, I don’t feel the gall to ask total strangers “Do you really need another martini?”, “How about salad instead of fries?” or “Are you sure about the tank top?” – even after it’s clearly too late. When I was a kid growing up in the ’70s and ’80s in Lakewood, Ohio, a suburb of Cleveland, riding a bike was fun, not serious. In our early years, we rode upright on Huffy Dragsters and dirt bikes, doing fast turns, going down hills and catching air on crude homemade ramps on the driveway. And sometimes we fell. When we fell, whether sideways or front-ways, our hands met the ground. We didn’t wear special bicycling clothes, and none of us wore helmets. I was the youngest of five when I learned to ride a bike in the mid ’70s. My oldest sibling, my sister Tracy, had an upright Schwinn. Between her bike, my bike, my other siblings’ bikes in the garage and most of the other bikes in the neighborhood, the mode of cycling was upright. Still no special cycling clothes, still no helmets. 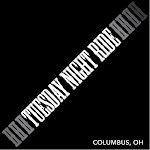 Columbus wants to turn a car-heavy corridor into a friend-lier route for bicyclists. The city is installing a ramp from W. Goodale Street to the Olentangy Trail, which runs beneath the street and between Rt. 315 and the Olentangy River. The ramp will include a flat, covered balcony that overlooks the path, where cyclists can slow down before entering the trail below.A stretch of sidewalk on the north side of Goodale will be widened to accommodate both pedestrians and cyclists. Construction was scheduled to start in August but was pushed back when bids came in about $1 million over the $4.3 million the city budgeted for the project, said Terri Leist of the Recreation and Parks Department. The city has rebid the project after cutting some amenities, such as ornamental railings, Leist said. It expects to open new bids in late June, putting the project behind by about six weeks.